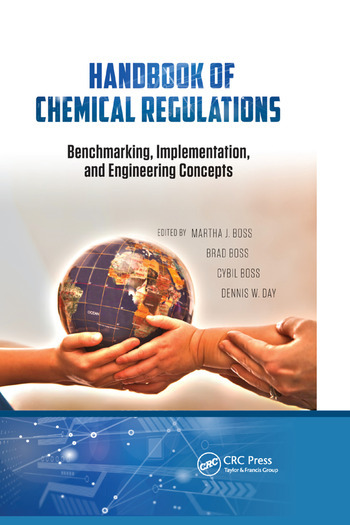 The first book of its kind, Handbook of Chemical Regulations: Benchmarking, Implementation, and Engineering Concepts introduces the concept of global harmonization and interlinks between regulations and examines the reasons behind major requirements for chemical manufacture, article production, and distribution, importation, and usage. A compendium of environmental, health and safety, and engineering concepts for global harmonization, the book provides a road map between regulations from the European Union, the United States, and other countries who adopt similar regulations. As with any road map, not every feature along the road is mapped; however, what is shown are the markers leading to a point where more effective stewardship of your industrial development and chemical usage base is possible. The book discusses the Eurpoean Union’s Regulation (EC) No 1907/ 2006 - Registration, Evaluation, Authorization and Restriction of Chemicals (REACH), the Eurpean Union’ s Regulation (EC) No 1272/2008 for classification, labelling and packaging of substances and mixtures, and the United States Occupational Safety and Health Administration (OSHA) perspectives for Safety Data Sheet (SDS) development and product labeling. In addition, the United States Toxic Substance Control Act (TSCA) and Federal Insecticide, Fungicide, and Rodenticide Act (FIFRA) are presented as regards TSCA new substance review critiera and FIFRA required labeling. This compendium of information aids in the successful integration and implementation of the regulatory requirements—an integration that should lead to more efficient and effective business decisions. Rather than reacting to one regulation at a time, making policy decisions that reflect the underlying conceptual framework of GHS will lead to safer products and safer industrial production sites. Based on a framework for regulatory standards, this easy-to-read guide helps you understand the scientific concepts that are inherent in chemical usage and their interplay globally. Global Harmonization. REACH General Articles. REACH Annex I General Provisions for Assessing Substances and Preparing CSRS. REACH Annex II and OSHA SDS. REACH Registration Annexes VI TO XI. REACH Annex XII General Provisions for Downstream Users to Assess Substances and Prepare Chemical Safety Reports. REACH Annex XIII Criteria for the Identification Persistent, Bioaccumulative and Toxic Substances, and Very Persistent Bioaccumulative Substances. REACH Annex XV Dossiers. REACH Annex XVI and XVII and Appendices 1 to 7. OSHA and CLP Labeling. OSHA and Annex I CLP PART 1 General Principles for Classification and Labeling. OSHA and CLP PART 2 Physical Hazards. OSHA and CLP PART 3 Health Hazards. EPA and CLP PART 4 Environmental Hazards. DOT and (CLP) Annex II Special Rules for Labeling and Packaging of Certain Substances and Mixtures. OSHA and (CLP) Annex III List of Hazard Statements, Supplemental Hazard Information, and Supplemental Label Elements. OSHA and (CLP) Annex IV List of Precautionary Statements. OSHA and (CLP) Annex V Hazard Pictograms and Annex VI Harmonized Classification and Labeling for Certain Hazardous Substances. OSHA Written Hazard Communication Program. Toxic Substances Control Act (TSCA). FIFRA Title 40: Protection of Environment; Part 152—Pesticide Registration and Classification Procedures. Glossary. Martha J. Boss, CIH, CSP–URS–Principle Industrial Hygienist, has expertise in REACH, CLP, OSHA, GHS, FIFRA, TSCA, EPA, and European Union global harmonization requirements. Ms. Boss has over 24 years’ experience in risk management including analysis of statistical parameters, severity and probability associated with health risks, toxicological profiles (including those associated with APIs), occupational exposure limits, biological safety levels, physical hazards (electromagnetic, ionizing and non-ionizing radiation), and hazardous or mixed (radiological and chemical) materials. She has authored guidance documents, safety and environmental manuals for the Department of Defense, safety and industrial hygiene training materials for the Department of Labor, risk management documents for NIOSH/CDC, investigative reports for the Federal Emergency Management Agency (FEMA), design analysis for the Department of Homeland Security, training texts for the Department of Interior/Bureau of Indian Affairs, and numerous reports for the Environmental Protection Agency. Ms. Boss has provided compliance auditing, contractor oversight, industrial hygiene, safety engineering, emergency response and risk management planning. Ms. Boss has authored original safety program documents, authored guidance documents, and audited compliance for management systems, environmental regulations, safety, and industrial hygiene. She has expertise in indoor air quality and ventilation evaluation, due diligence assessments, biological risk assessment, pollution prevention and waste minimization studies, and industrial hygiene/safety engineering design analysis. Ms. Boss has provided clients with interdisciplinary expertise in hazard analysis and the required planning to mitigate hazards. Martha is co-editor and author of the Building Vulnerability Assessments, Biological Risk Engineering Handbook and Air Sampling and Industrial Hygiene Engineering texts published by CRC Press division of Francis and Taylor. She has audited international programs to determine client compliance with United States, EU, and Asia-Pacific requirements. Brad Boss–URS–Senior Environmental Scientist is an Environmental Scientist with more than 12 years of experience in the environmental field, working with both commercial industry and Department of Defense facilities. His experience includes hazard communication, risk assessment, hazardous waste field work; groundwater investigations; soil investigations; environmental site assessments; indoor air quality assessments; asbestos and lead inspections; and preparation of cost proposals. He has been the lead author for work plans, Long-Term Monitoring (LTM) reports, Phase I and II reports, Remedial Investigation reports, Feasibility Studies, and contaminated soil excavation reports. "The authors of this text have dug deep to provide their readers with a comprehensive and meaningful environmental resource that goes beyond the traditional text. For the avid/committed professional and those focused on compliance and programmatic concerns, this text will be a sound addition to their library. … I applaud the authors focus and approach … a practical, detailed guide that will give those in the environmental management field a true leg up when trying to manage, design and improve their programs." "… an excellent reference source for the education and training of occupational safety and health professionals who are involved in the handling of chemicals or use of chemicals on site. … clearly written and carefully cited with examples on the regulatory requirements on hazard communication, labelling, packaging, etc. in some major regions worldwide. Readers can better understand the practice across the continents, the significance of legal requirement and application."